BANGKOK: The Royal Remains of the late King Bhumibol Adulyadej embarked on their final journey yesterday (Oct 29) in processions which concluded the five-day-Royal Cremation ceremony before the official mourning period ended at midnight. His Majesty King Maha Vajiralongkorn Bodindradebayavarangkun presided over a royal ceremony to transfer the relics of his father, the late King Bhumibol, from the Dusit Maha Prasat Throne Hall to the Chakri Maha Prasat Throne Hall inside the Grand Palace. 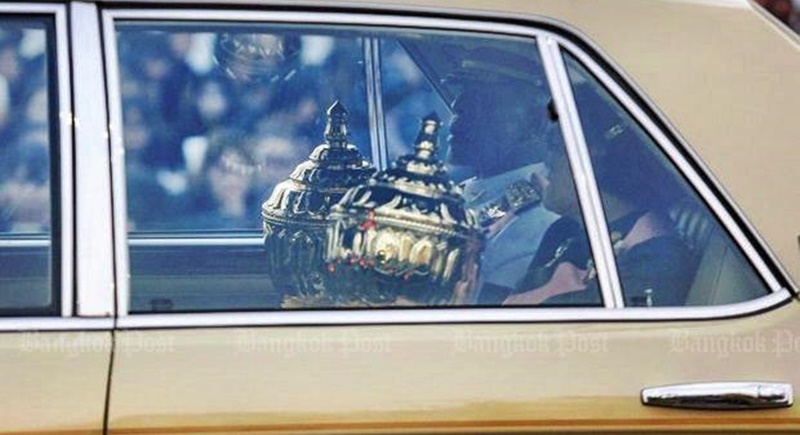 A specially made Royal Golden Urn holding the late King’s relics was placed on the ornate Rajendrayan four-poled palanquin and carried in a Royal procession from the Dusit Maha Prasat Throne Hall to the adjacent Chakri Maha Prasat Throne Hall. His Majesty accompanied the procession, along with Her Royal Highness Princess Maha Chakri Sirindhorn and other Royal Family members. When the procession reached the Chakri Maha Prasat Throne Hall, a palace official carried the Royal Urn into the hall where it was enshrined. His Majesty paid respects to the royal relics before leaving. The cremated ashes of the late King were also enshrined at Wat Ratchabophit Sathit Maha Simaram and Wat Bowon Niwet Vihara. Two caskets containing the Royal Ashes were moved from the Phra Si Rattana Chedi, a main pagoda in the Temple of the Emerald Buddha inside the Grand Palace. Each of the caskets was then carried on two palanquins to the waiting royal motorcade. His Majesty the King and Her Royal Highness Princess Maha Chakri Sirindhorn held each of the caskets themselves as they left the Grand Palace. The motorcade was led by 78 mounted soldiers from the 29th Cavalry Battalion which was waiting in a ceremonial procession – the final of six arranged for the Royal Cremation ceremony. The cavalry procession was led by Her Royal Highness Princess Sirivannavari Nariratana, the granddaughter of the late King. When they reached Wat Ratchabophit, palace officials took the two caskets from the King and the Princess and carried them into the temple’s ubosot main hall. Crowds of people wearing black were waiting at the temple to watch the royal ceremony. After, 30 monks led by His Holiness the Supreme Patriarch finished prayers in the temple main hall, the King offered each of the monks saffron robes. After the religious rites, His Majesty enshrined the Royal Ashes inside the base of Phra Buddha Angkheeros, the principal statue in the temple’s main hall. The King paid respects to the Buddha statue before leaving the temple. A palace official then carried the other casket containing the Royal Ashes out of the temple’s ubosot to the royal motorcade. Led by the cavalry, the royal procession then headed to Wat Bowon Niwet. His Majesty the King held the casket himself while travelling in the royal motorcade to the temple. The bond between Wat Bowon Niwet and the late King Rama IX was particularly strong as he spent his 15-day spell in the monkhood there following his ordination at the Temple of the Emerald Buddha in 1956. When the procession reached the temple, a palace official took the casket from the King and carried it into Wat Bowon Niwet's ubosot main hall. Following prayers by monks, the King offered saffron robes to each of the monks. The King then enshrined the Royal Ashes inside the base of Phra Buddha Shinnasee, the main statue of the temple. This concluded the five-day Royal Cremation ceremony for the late King Bhumibol Adulyadej. Tens of thousands of mourners dressed in black lined the streets to watch the ceremonial procession from the Grand Palace and Sanam Luang ceremonial ground to the two temples. Many people were still seen crying as they sat among the masses. Chutima Salakorntanawat, a 68-year-old retiree from Bangkok, said she still feels a deep connection with the late monarch, even though over one year has passed since his death last October. Now residing in Samut Prakan, she originally lived much of her life in Bangkok. According to her, she had the opportunity to meet the late King Bhumibol Adulyadej on several occasions, as she often visited the Emerald Buddha temple when he also went to the temple to make merit. “Once, His Majesty looked at me and humbly said, ‘How are you?’ and I was unable to answer him with a single word,” Ms Chutima said. “I remember him saying that it was all right, and told me to talk how I would normally,” she added. “All I was able to say was, ‘I am well,’” she said, beginning to sob uncontrollably. She recalled from her experience that the late King had also asked several other citizens about their lives at the temple. Ms Chutima had also travelled to the Royal Ceremonial ground last Thursday (Oct26), but was unable to enter Sanam Luang to witness the Royal Cremation ceremony. However, she said she has no regrets about missing the cremation, as she was present to “send the father of the nation off”. “You can ask anyone here, and they’ll tell you what a privilege it has been to have been born under his reign,” Ms Chutima added. Also among the waiting public yesterday were several volunteers around the area, who were faced with their final day of service, as the processions were due to conclude in a few hours’ time. They said they were honoured to have done their duty for the late King by volunteering to help the large crowds who turned out for the cremation.